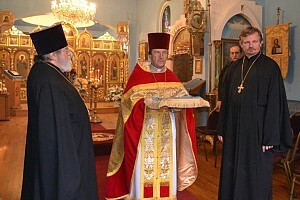 His Eminence was greeted at the church with the traditional offering of bread and salt by Peter Budkin (parish Trustee ) as Archpriest John Prokopiuk (parish Rector) welcomed the Archbishop and presented a Cross to receive a blessing. Serving at the Hierarchical Divine Liturgy with Archbishop Michael were: Archpriest Father John Prokopiuk, Archpriest Samuel Kedala (retired), Archpriest Volodymyr Zablotsky (Rector, Saints Peter & Paul Church, Buffalo NY, Proto-Deacon John Morvay (parish Deacon), Proto-Deacon John Suchernick, Deacon Stephan Karlgut (Deacon to His Eminence), and Sub-Deacon Mark Federoff. 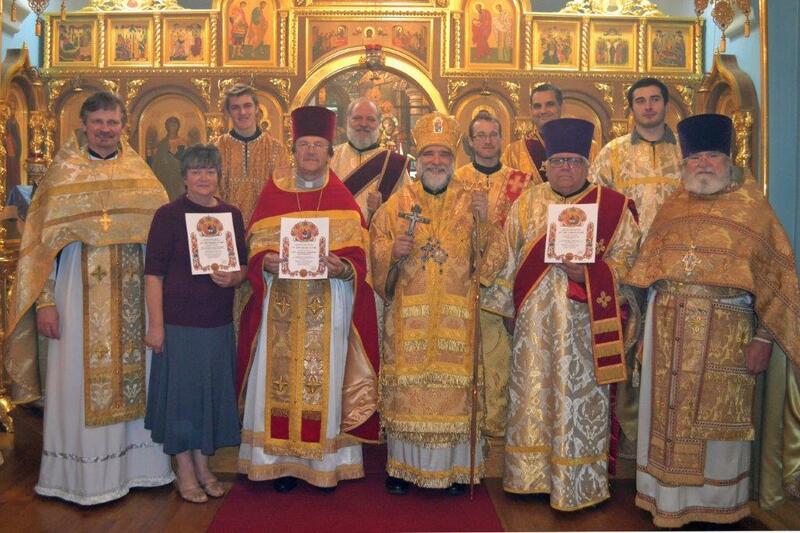 At the conclusion of the Hierarchical Liturgy, Archbishop Michael presented Gramotas (certificates of appreciation) to the Archpriest John and Matushka Ludmila on the occasion of their 40th Wedding Anniversary, and to Proto-Deacon John on the 25th anniversary of Diaconal Ordination. A festive and celebratory banquet was held in the church rectory. At the banquet, His Eminence offered congratulations and was followed by words of rejoicing from Father Samuel and Father Volodymyr.